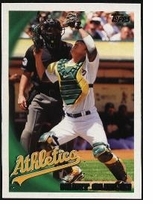 The 2010 Oakland Athletics Topps MLB Team Set contains 28 Oakland Athletics baseball cards including Star Players like Andrew Bailey, Henry Rodriguez, Eric Chavez and Kurt Suzuki. 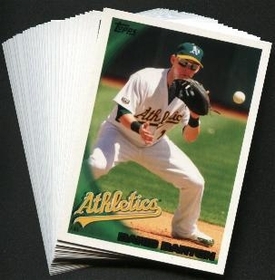 The baseball card collecting hobby has always been well suited to the baseball fan. By collecting baseball cards of your favorite MLB baseball team you can keep track of your teams players and show off your team pride all at once. Topps Baseball cards have been collected longer than any other brand on the market today and card collecting has been a fun family activity for many years. All cards in the team set are listed below.